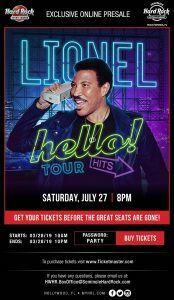 * Exlusive Online Presale: LIONEL- Hello! Tour. Jeff Eats and Mrs. Jeff Eats are big time Lionel Richie fans! We are definitely gonna catch some tickets. This contest started on 3/21/19. This contest has a winner. * Win A $25 TJ MAXX Gift Card. The $25 Gift Card is good at any TJ MAXX location (tjmaxx.tjx.com for locations, info). This article first appeared on October 3, 2018. Just checked the Coral Springs Center For The Arts’ box office (thecentercs.com) and there are a handful of really good tickets left to see Sarge and The Edwards Twins. Trust Jeff Eats on this one, this is gonna be a killer show! The bet here is that Sarge and The Edwards Twins is gonna be a SRO affair, so if you wanna go and don’t yet have tickets- I’d suggest that you get busy! Posted on October 3rd, 2018. * Master Impersonators The Edwards Twins & National Headline Touring Comedian – Sarge. Trust Jeff Eats on this one- awesome and I do mean AWESOME show! The bet here- SRO! So if you wanna go, buy tickets NOW! Anthony & Eddie Edwards are considered by most of the major newspapers, magazine and TV shows in the country as the most talented twins in the world today. Whether it’s playing piano, dancing, acting, singing or doing over 100 impressions of the top super stars in the world, The Edwards Twins will WOW all age groups from 5 years old to 100. The Boston Globe amazingly wrote, The Look-a-likes are startling and amazing! These Celebrities illusionists will make you forget that you’re watching a pair of identical twins, and make you think you’re in Las Vegas watching a night of 100 Stars. Now in their 20th year, The Edwards twins will be one of the best show you will ever see in your life time. Sarge is an extraordinary entertainer. A triple threat. A musical piano savant and amazing improvisational comedian and singer. He is an entertainer who has performed worldwide to adoring audiences. His sidesplitting comedy, touching vocals and stunning display of dexterity as a pianist have wowed crowds for decades. He is one of the highest energy, multi-talented acts in show business today. Not only a hysterical stand-up comedian, Sarge sings in his own voice and in a dozen others including Harry Connick Jr, Sammy Davis Jr, Lionel Richie and Stevie Wonder. Additionally, his dead on impressions of Marv Albert, Mike Tyson, Kermit the Frog and Gilbert Gottfried leave audiences howling and clamoring for more. Triple threats who don’t dance are hard to find in show business today. With his mix of comedy, singing and piano playing, SARGE is a legitimate triple threat and a rare find. This contest started on 3/22/19. This contest has a winner. * Win A $10 Five Guys Burgers and Fries Gift Card. Jeff Eats got a $10 Five Guys Burgers and Fries Gift Card to give to one of you guys! 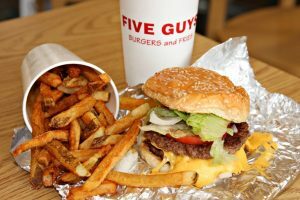 The $10 Gift Card is good at any Five Guys Burgers and Fries location (for locations, menu, info- fiveguys.com). * Win A $25 The Stage Restaurant & Full Bar Gift Card. Jeff Eats got a $25 The Stage Gift Card to give to one of you guys! The $25 Gift Card is good at The Stage Restaurant & Full Bar, 9144 Bonita Beach Road, Bonita Springs, Florida 34135, (239) 405-8566. Check stagebonita.com for entertainment schedule/menu/info. ***** The Stage, 9144 Bonita Beach Road, Bonita Springs, Florida 34135, (239) 405-8566. Got a really cool “music-dance-eat-drink” joint for you…The Stage located in Bonita Springs. At this stage of the “story” do me a huge favor and check www.thestagebonita.com…in a nutshell, on Wednesday, Thursday, Friday, Saturday starting at 4pm The Stage features some of the best original bands, cover bands and tribute acts in Florida. Sometimes the “music” is free and sometimes there is a cover charge. To round things out, The Stage has a full-bar and a menu loaded with very reasonably priced “decent enough” appetizers, salads, burgers, sandwiches and meat/chicken/seafood entrees. The play here…get a good table and plan on staying awhile. In recent months I’ve been there twice and I had a blast. * Win A $10 IHOP Gift Card. Jeff Eats got a $10 IHOP Gift Card to give to one of you guys! 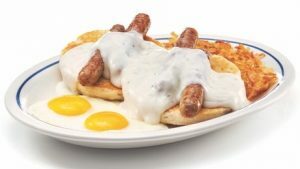 The $10 Gift Card is good at any IHOP location (check ihop.com for locations/menu/info). 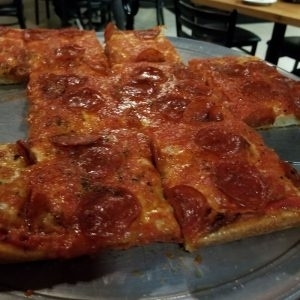 ***** DISH OF THE WEEK (Sunday- 3/24/19- Peters Road Deli). ***** Peters Road Deli, 4353 Peters Road, Plantation, Florida 33317, (954) 587-5456. Got a real good reasonably priced sub/sandwich/salad/pasta joint for you guys to checkout- Peters Road Deli in Plantation. Three guesses, how the joint got its name- and the first two guesses don’t count! 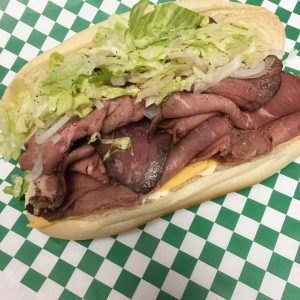 Simple tale here- order/pickup at counter, no inside or outside seating, menu of hot/cold subs-sandwiches/salads/pasta dishes, open Monday-Saturday 9am-5pm/closed Sunday. Jeff Eats and Mrs. Jeff Eats discovered Peters Road Deli a couple of weeks ago and I gotta tell you guys, the joint’s food absolutely killed! Now- you guys and Jeff Eats both know that sub joints are literally a dime a dozen down here in sunny-Florida- with that in mind, trust me when I tell you that Peters Road Deli makes real (and I do mean real) delicious stuff! Let me wrap Peters Road Deli up for guys by saying- that if the joint was a drop closer to Jeff Eats and Mrs. Jeff Eats’ Boca Raton abode- we’d be real-steady customers! This contest started on 3/23/19. This contest has a winner. 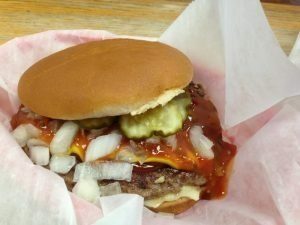 * Win A $10 Jack’s Old Fashion Hamburger House Gift Card. The game- the first 15 reader-comments” received – will be entered in a “blind hat pick”! You can submit as many comments as you’d like but- Please, only 1- reader comment – per day…play fair! The $15 Gift Card is good at both- Jack’s Old Fashion Hamburger House, 4201 North Federal Highway, Oakland Park, Florida 33308 (954) 565-9960 & 591 South Cypress Road, Pompano Beach, Florida 33060, (954) 942-2844. You can check locations/menu/prices/info at jacksoldfashionhamburgers.com. ***** Jacks’ Old Fashion Hamburger House, 4201 North Federal Highway, Oakland Park, Florida 33308 (954) 565-9960…&…591 South Cypress Road, Pompano Beach, Florida 33060, (954) 942-2844. Jack’s Old Fashion Hamburger House has 2 South Florida locations…the Oakland Park joint opened in 1972 and the Pompano Beach store in 1973. Jack’s is a fast-food hamburger joint. Jack’s has other stuff, but HAMBURGERS ARE THE GAME. Both Jack’s locations are literally “landmarks.” They are always busy. The hamburgers are very-very good. The fries are okay, but nothing to write home about. Over the years, I must have eaten (combined) in the 2 different locations something like 30 times. These joints are fast-food joints circa 1970. I like the “unmodern” (if that’s a real word) look…old tables and no stainless steel/formica/vivid colors/signage that joints like Burger King, Wendy’s etc have. I also like the “crowd” that these joints draw. Guys in suits, families, blue color workers…the parking lots, have cars in every price range…the point, Jack’s has a legendary following in South Florida. Now for the good news and bad news…To be perfectly honest with you, I use to make special trips to eat at Jack’s…Now that Five Guys Burgers & Fries has started to open in the South Florida market, I would rather eat at Five Guys than Jack’s. Like I said, Jack’s hamburgers are very-very good… while Five Guys’ hamburgers and fries are terrific. Though it’s a story for another day, Five Guys Burgers & Fries is quickly developing a cult following in South Florida…and for that matter, all of the United States. Don’t get me wrong…you won’t be disappointed eating at Jack’s…which is open 7 days a week from 10:30am-9:30pm…but this 1970’s icon is now getting some real tough competition from Five Guys. This contest started on 3/19/19. This contest has a winner. * Win A $20 Fish Shack Gift Card. Jeff Eats got a $20 Fish Shack Gift Card to give to one of you guys! The $20 Gift Card is good at Fish Shack, 2862 Northeast 17th Avenue, Pompano Beach, Florida 33064, (954) 586-4105. 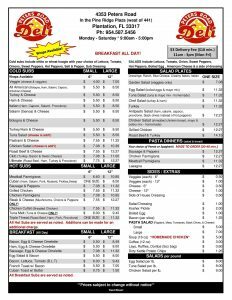 You can check menu/prices/info at fish-shack.business.site. ***** Fish Shack, 2862 Northeast 17th Avenue, Pompano Beach, Florida 33064, (954) 586-4105. 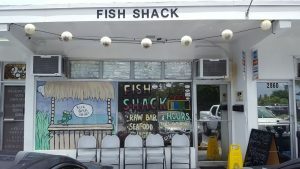 Jeff Eats recently “discovered” an absolutely amazing “mom & pop” fish joint…Fish Shack in Pompano Beach. Wanna talk hole-in-the-wall? The joint is located in a miniscule bombed-out strip center…maybe table seating for 20 and 5 at the bar. Fish Shack’s menu is loaded with fish-stuff…that said, it has hamburgers, chicken breast sandwiches, wraps, salads and chicken wings for the non-fish eaters that may-be in your party. Outrageously delicious reasonably priced…blackened red snapper–grilled yellow fin tuna–conch fritters–fried oysters–cheeseburger–shrimp burger. Every so often Jeff Eats comes across an absolute HOMERUN…Fish Shack is a GRAND SLAM! Like I said a few seconds ago…hole in the wall, fabulous food. I highly recommend that you try Fish Shack. The bet here–you won’t be disappointed. Fish Shack is open Monday-Saturday 11am-9pm, closed on Sunday.